You can protect both the stallion and mare against kicking injuries during breeding by fitting Old Mac’s Multi-purpose Horse Boots. The unique outsole design will also significantly improve traction during serving. Our equine friends often suffer skeletal structure injuries due to losing their footing on greasy or hard surfaces. This sudden hyper-extension of the limbs can cause serious spinal, joint and/or ligament damage. Riders, too, are often injured as a result of a horse losing its footing and falling on its rider. The traction offered in Old Mac’s unique hi-tech performance outsole helps ensure a safe ride for you and your horse. The G2 has a new tread pattern that provides aggressive traction while eliminating pressure on sensitive internal hoof structures. While traction is extremely important, very aggressive traction can inhibit a horse’s natural way of going, and can increase stress on joints, tendons and upper extremities. Another enhancement of the sole is the removal of the point at the toe. The G2 tread is rounded for a natural breakover, softening the miles and miles of riding you’ll do in your boots. For horses whose hooves were too narrow to fit into the Old Mac’s there is good news! The shape of the sole on the G2 is different that the original. The new shape is slightly longer than wide, and will fit a greater percentage of horse’s feet. This is an important feature that will allow more horses to wear the boots comfortably and without inserts. Along with the new shapes comes new sizing. You will have to carefully measure and review the new charts in order to fit your new boots. The new Front Protective Shield prevents wear at the front of the boot. 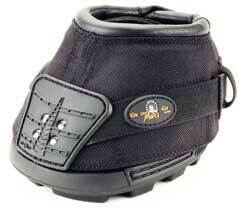 Old Mac’s G2 Multi Purpose Horse Boots™, designed and developed in Australia, are a revolution in the equine world. Aimed at improving your horse’s soundness, well being, and performance, an Old Macs G2 hoof boot set will extend your horses working life. Old Mac's G2 Multi Purpose Horse Boots are a genuine and natural alternative to metal shoes. Every Old Macs G2 hoof boot facilitates the natural shock absorbing, weight bearing function of the hoof. Old Mac's G2 will eliminate brittle hoof walls and the stress and trauma caused to your horse through constant nailing. Protect both Stallion and Mare against kicking injuries by fitting Old Mac’s G2 Multi Purpose Horse Boots™. The unique outsole design will significantly improve traction during serving. Our equine friends often suffer skeletal structure injuries due to their losing footing on greasy or hard surfaces. This sudden hyper-extension of the limbs can cause serious spinal, joint and/or ligament damage. Riders too, are often injured as a result of a horse losing its footing and falling on its rider. The traction offered in Old Mac's G2 unique high-tech performance outsole helps ensure a safe ride for you and your horse.